Staggered Cove Station is a story that I was certain I was going to love based on what I had read from the blurb. Unfortunately, it didn’t quite turn out that way. Now, I’m not saying I hated or didn’t enjoy it, because there was a lot about the book that I did like. It just wasn’t what I expected. 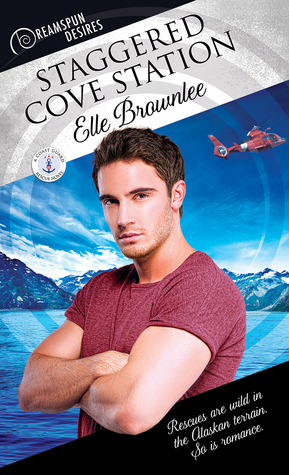 The story revolves around a Coast Guard station in Alaska and the people who work there. New arrival Dan Farnsworth has come to the station with a secret. He knows all about the rescue swimmer that has gone missing and is presumed dead, and he believes that there’s some sort of cover-up going on within the station. He knows the person who is missing was one of the best and strongest swimmers around, so doesn’t believe he would have gotten into any kind of trouble in the water that would have led to his drowning and disappearance. Dan plan’s to fully investigate what happened without letting anyone know that’s what he’s doing. His main suspect, the person who was in charge of the operation that day and who he believes is responsible, is the locally-born Alaskan native, and now Dan’s new roommate, Karl Radin. Karl Radin has been a member of the Coast Guard for many years. Karl is meticulous about everything he does, that way there’s less chance for something to go wrong. He loves his job and takes it very seriously. But due to his experience and length of service, he also gets a little bit more leeway with the boss than the rest of the team. When the station’s previous rescue swimmer went missing, it really affected Karl. He can’t stop thinking about what went wrong or if there was something he could have done differently. The fact that they’ve still not recovered the body just leaves a lot of unanswered questions. When Karl discovers that Dan is his new roommate, he’s kind of shocked as he’s almost always had the room to himself. But just to add to the issue, Dan seems to have some sort of chip on his shoulder and doesn’t come across as being the friendliest of people to have to share with. The other problem is that Dan is extremely attractive. So even though Karl knows he’s attracted to men, it’s not something he’s acted on as the job has always come first, but being in such close proximity to Dan, even with his chilly attitude, is going to test all his resolve. Over the time working together the two men begin to form a good working relationship and friendship. But also discover that the mystery of the missing team member isn’t all what it seems. This brings them even closer, to the point where the attraction to each other is something that can’t be ignored any longer. As I’ve already said, there was a lot about this book that I did really like. I loved the story concept and plot. It was really well thought out and had a few good twists to add to the excitement. I liked the characters and how their relationship developed across the story. Based on what I got from the story Karl is older than Dan, but as we never find out their ages, I don’t know how much of an age-gap there is. It could be anything from 8-20 years. This is one of the small details I like to know. I also had a couple of issues with how the story was written. Often there was a jump between the characters dialogue and I found myself having to go back a few sentences or paragraph to remind myself what was going on. I also found the pace of the story to be a little slow for my liking. Overall, it was a nice and easy read with a great little HFN ending. And even though I was expecting more, I can’t say I was left feeling disappointed because I really wasn’t. It was definitely a story worth reading.